Grand Canyon Airlines has grown to be the largest and oldest aerial tour company on earth. After pioneering the first commercial air tour, we have proudly flown more than 100 million passengers to the Grand Canyon, Rainbow Bridge, Monument Valley, and beyond. We eagerly await the opportunity to reveal the wild desert beauty of the American Southwest to you and your family. At Grand Canyon Airlines, we challenge ourselves daily to provide our guests with a sightseeing experience more innovative and memorable than the last. Over the past ninety years, our company has evolved from a small business offering local airplane tours into the most recognized air tour company in the world. Today, GCA offers an array of flights that transport our passengers to some of the most impressive natural landforms in the American Southwest. Our Grand Canyon endeavors have expanded to include trips to Monument Valley, Rainbow Bridge, Antelope Canyon, Tower Butte, and many other desert destinations. Our teams work tirelessly to imagine even more exciting sightseeing adventures to show our passengers the most captivating natural formations in the desert US. 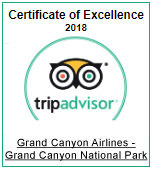 Our dedication to service and safety is unmatched by any other Grand Canyon touring company. The environmental impact of our equipment and the preservation of these fragile landforms is of utmost importance to us, as they belonged to this Earth long before we did. We eagerly await the opportunity to fly you to these incredible American landmarks and provide you with an airborne sightseeing experience unlike any other. The bustling international hub of entertainment is actually surrounded on all sides by magnificent desert landforms just beyond the city limits. Discover the world-famous sights of mile-deep rock gorges and striped canyon walls that stretch across the horizon. Here the rugged nature and Wild West atmosphere combine with unique rock formations and canyon viewpoints for a delightful sightseeing experience. Witness the dazzling walls secluded within this canyon. Nearby are the colossal Tower Butte, Horseshoe Bend, and Lake Powell.